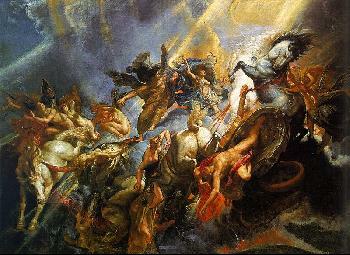 Baroque Art, Peter Paul Rubens. "The Fall of Phaeton"
There is a difficulty in art history defining exactly what Baroque art is, when it actually existed and which famous artists and famous paintings belong to this period. Baroque could be the last stage of Renaissance art or it could be the beginning of a new period of painting. If it is a new style it must be distinguished from the Renaissance style having a clear set of stylistic principles. Originally the word Baroque was a disparaging word used to describe post- Renaissance architecture being unstructured, unornamented, theatrical, and grotesque. This definition and description has faded over the years and Baroque is a term used today for art created roughly between 1600 and 1750. Baroque art was not specifically Italian, although it is thought to have begun in Rome. It quickly spread to the Protestant North, and Baroque characteristics were applied to subjects other than religion. Baroque then may be a blanket term representing a changing art style . Time is important to painters of the Baroque period. They saw time as a measurable entity. Time strips away falsehoods revealing truth and vindicates good over bad. This sense of time is recurrent throughout art and literature of the Baroque art Period. Shakespeare wrote about time and it's changes of the human physique. Jacob van Ruisdael painted compositions recording the relentless power of Nature changing the structure and physical elements of Nature itself through time. The subject matter of Old Man Time carrying a scythe reeking destruction of young children was a popular theme among painters. Time to the Baroque painter was instantaneous and eternal. Peter Paul Rubens is a good example in history of the transition from High Renaissance, Classical art, to Baroque art. Rubens, a Flemish artist having studied in Italy for eight years was familiar with Titian, Michelangelo, and Leonardo. He copied Leonardo's drawing "Battle of Anghiari", a tumultuous sublime battle, of the immediate moment. Rubens showed he understood the heroic, muscular, monumental, formal compositions of Italian art painting his famous painting, "Elevation of the Cross". Until the time of Rubens the Flemish tradition was orientated toward landscape painting and portraiture. Flemish art was rich in detail with conservative compositions. As an painter trained in Flanders, Rubens understood both styles of painting. To these styles he added his own style in one of his paintings, "St George and the Dragon"1606-10. St. George is a heavily muscled, heroic figure of Renaissance art riding a spirited horse. Rubens paints St. George wearing a suit of armor painted in Flemish character. The armor is detailed realistic, and highly reflective. To the left of St. George is a statue-like looking woman, another characteristic of Classical Art. To these characteristics Rubens adds action, and emotion, a scene painted in the instant of a moment. Combining these things with a strong contrast of light and dark adding rich colors, we begin to have an understanding of Baroque art that had an influence on artists for the next one hundred years. The Spanish painter Caravaggio had done something similar in his famous paintings of 1600-01, in particular "Conversion of St. Paul". In another work of art "Calling of St. Matthew, 1599- 1602, Caravaggio invented a new "naturalism" in art history. He painted a religious theme in a commonplace, everyday tavern, using peasant low-lives as subject matter. Rubens and Caravaggio together have many characteristics of the Baroque period. They also add the freedom of expression. Other famous artists of this period are Peter Paul Rubens and Anthony van Dyck. To view the Baroque Art "poster gallery", click here. To view selected artist's paintings, click on the icons below. Subscribe with your Reader, to my RSS Baroque Art feed: http://www.